Bring rustic elegance into your bedroom with our Real Hickory Arizona Log Bed. A unique Southwestern pattern made from hickory logs decorate the upper portion of the headboard and footboard while small hickory spindles form the lower headboard and footboard sections. The thick and rugged hickory bark adds dimension and color contrast to your hickory bed. Each hickory bed will be finished with a special finish to ensure the wood is sealed and protected. If you like hickory furniture, check the rest of our Real Hickory bedroom collection. We have mattresses too! Twin, Full/Double, Queen, or King. Due to the natural materials used in the crafting of our rustic furniture, dimensions can have up to a 2” width & depth variance. "You are so AWESOME! Thanks for going the extra mile. I cant wait to do business with you in the future. Signed one happy customer." -Tom J. 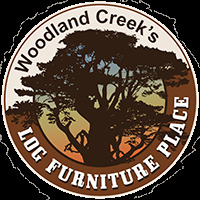 © 2019 Woodland Creek Furniture. All Rights Reserved.